The star at the centre of the solar system. The Sun is the nearest star to the Earth, at a distance of about 150 million kilometres. The Sun is at 8.5 kparsecs from the centre of the Milky Way. In the classification of stars, the Sun is type G2. The mass of the Sun accounts for most of the mass of the solar system. It is used as a unit of mass for stars. 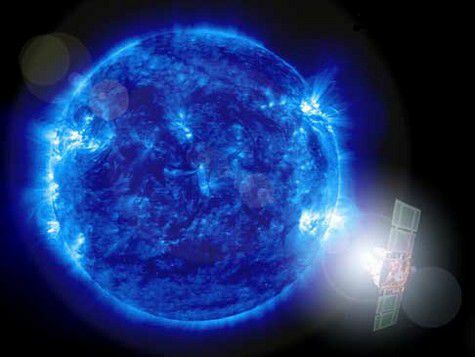 Solar energy, of vital importance for the Earth and for life, is produced by nuclear reactions taking place at the centre of the Sun. The Sun is about 5 billion years old and will continue to shine with gradually increasing brightness for a similar period before evolving into a red giant, finally dying. The apparent motion of the Sun relative to the Earth gives the seasons, due to the inclination of the ecliptic plane relative to the Earth's equator. In 1611, Galileo discovered that the Sun rotates on its axis every 27 days. There are various layers in the Sun, among which are the core or heart, the radiative zone, the convection zone, the photosphere (which emits most of the sunlight), the chromosphere and the external part, the corona. The density decreases with altitude, from the core to the atmosphere. The temperature at the core is of the order of 15 million kelvins. It decreases in the radiative and convective zones. In the photosphere, which is the visible surface of the Sun, it is of the order of 5800 K on average. In the lowest layers of the chromosphere, the temperature decreases with altitude to around 4500 K, before increasing again, especially in the transition zone, where this increase is very fast over a small thickness. The temperature of the corona reaches levels as high as 106 K. This extremely high temperature is still not totally understood. The solar atmosphere is a complex environment composed of plasma subjected to an intense magnetic field, where there are solar flares and the solar wind is emitted. Sunspots, which appear dark because of their low temperature are, like the corona, radio sources. Solar activity related to these phenomena varies cyclically. Recently, helioseismology has enabled a better understanding of the internal structure of the Sun. The internal convective layer is known only by the waves studied in helioseismology and through a study of solar neutrinos, produced during the nuclear reactions in the core. The deficit of solar neutrinos observed compared with those expected is one of the unanswered questions in solar astrophysics. Solar spectra are observed with spectroheliographs. This spectrum has lines, which have been known since Fraunhofer (in 1814) announced the presence of mainly hydrogen and helium and around sixty other elements. It also has bands that indicate the presence of molecules in the solar atmosphere.